Divorce is an ugly, often painstaking process. Even when the case goes smoothly, it is a time of sadness and heartache. 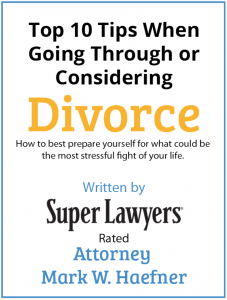 If you are having to go through this process, you are going to need a divorce lawyer in the St. Louis, MO area who you can trust—a divorce attorney who has your back and will fight for you. Haefner Law Office is ready and willing to help anyone who is having the misfortune of going through a divorce. Our locations are staffed by friendly, experienced divorce lawyers in St. Louis, MO, who are dedicated to helping the divorce process go as smoothly as possible. Award-winning Service: Our long history of excellent service has gained recognition from several esteemed institutions, including NAFLA, the American Jurist Institute, and the American Institute of Family Law Attorneys. Flat Rate Pricing: With flat rate pricing, you won’t have to worry about any hidden fees or costs. You’ll know what you’ll need to pay from the start. Personalized Attention: Our divorce attorneys in St. Louis, MO know that every divorce is different and will not only seek to fully understand your specific situation, but also will tailor their approach to fit your circumstances. Contact us today to schedule a free 30-minute consultation where we can thoroughly answer your questions! We’re family law attorneys in St. Louis, MO, and we’re on your side.